*DO YOU KNOW OR HAVE YOU SEEN HIM? 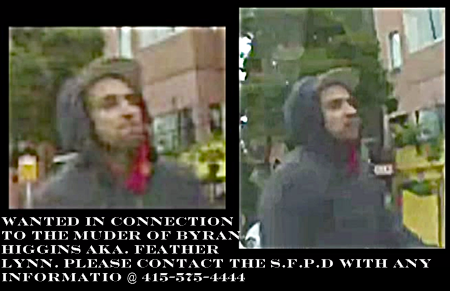 Anyone with information can contact the SFPD at 415-575-4444 or text TIP411 with “SFPD” at the start of the message. Last week the body of 31-year-old radical faerie Bryan Higgins aka Feather Lynn was discovered in the Castro District, outside of a church without identification. Feather was attacked which resulted in a brain aneurysm that left him on life support from which he was removed earlier this week. According to the site, the video was taken from a taxi cam, on 10 August, the day the victim was attacked. The blacked out portion is Bryan/Feather. PLEASE take a look if you live in the San Francisco area and lets try to catch this animal. Supermodel Claims Eating Chicken Turns People Gay…What? !